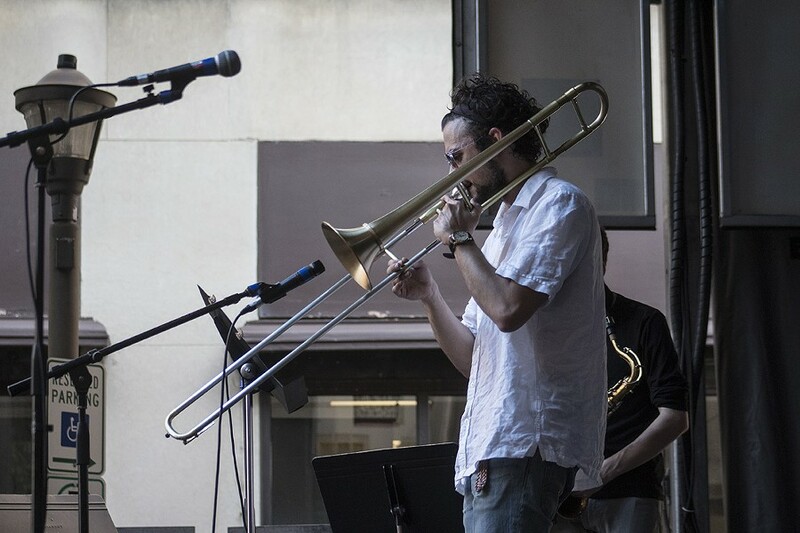 Rochester trombonist Abe Nouri played the Jazz Street Stage on Saturday at the Jazz Festival. 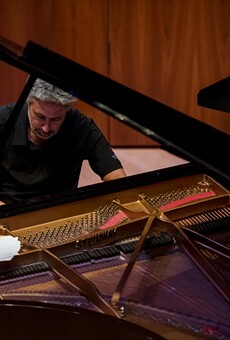 Pianist Geoffrey Keezer had an elegant approach to the keys during his first set at Hatch Hall. His confident technical facility and flair for the whimsical in melody was a delight to hear. And his precision in the right hand was mesmerizing. Keezer’s style as a whole was engrossing and effervescent, with a slight air of nostalgia. It was like reliving unspecified memories of childhood or lost love that you can't quite remember, but still feel deeply. The music was sentimental without being mushy or melodramatic, as Keezer delivered tender harmonies with great sensitivity to dynamics and the flow of phrases. The result was beautiful chamber music rooted in jazz. Rochester musician Abe Nouri took the Jazz Street Stage in the early evening of the sweltering Saturday with an accessible, feel-good set. Nouri was bubbly and buoyant on the trombone, and had a tone that was not so brash but not too laid-back, either. Alongside saxophonist Rowan Wolf, drummer Matt Bent, and upright bassist Ryder Eaton, the vibe was suave and self-assured. Bent and Eaton kept the rhythmic flow going with incessant syncopations and dance-inducing swing. Fittingly, I ended my 2018 Jazz Festival exactly where I started it — at Anthology. The Eric Krasno Band gave the crowd a riveting first set of blues rock with plenty of attitude and heart. Krasno, formerly of the band Soulive, was such an uninhibited, free-wheeling soloist, and brought a joyous spirit to his guitar playing. He also possessed a smoothly pleasant voice in a simple, heartfelt delivery. He and his energetic band navigated their way through originals and covers alike, with renditions of songs by rock ‘n’ roll greats like Janis Joplin and Gregg Allman. Krasno played some mean roadhouse blues, unfiltered and in your face, but he also eased back into slow-jam ballads. No matter the stylistic feel, these were predominantly songs of angry love, with unstoppable melodic flow. And Krasno knew when to dig in, laying into notes for extra spice and hitting pinpoint choral accents. This was music you could feel in the core of your soul — which is exactly what we've all been chasing after at Jazz Festival after all.